Close to Manchester, but in a place Mancunians know to be not quite of this planet, is the Finnish School in Liverpool. Our two schools have very different histories but good links, worth being aware of as we approach the end of term and Independence Day 2016. Liverpool's suomikoulu resides at the Gustav Adolfs Kyrka in the Baltic Triangle, otherwise known as the Scandinavian Seamen's Church, not far from the Albert Dock and Liverpool One. It's an impressive and very distinctive building. If you ever visit, take the opportunity to see the unique worship space at the top. 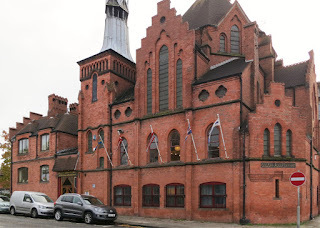 Apart from religious services, these days the building serves various other functions including the interests of the various Scandinavian communities in the Liverpool area, working together as LiNC. See the various flags outside. Co-ordinated Nordic events include film showings and a Christmas bazaar, this coming weekend I think(?). I've promised Mark to write a blog post since, let's see... last March. I'm planning to write about bilingualism but, meanwhile, I'm posting this link which my cousin has just sent me. It's heart-warming to see how many people across the world persist in learning this amazing language. Warning: contains very strong language.